President Donald Trump will host President Uhuru Kenyatta of Kenya in Washington for the first time on Aug. 27. It will be only the second time that Trump has met with a leader from sub-Saharan Africa since taking office. In Kenyatta's previous meetings with American leaders, including President Barack Obama and former Secretary of State John Kerry, issues such as the plight of refugees were discussed and the United States pledged more money to aid refugees living in Kenya. This meeting, however, is unlikely to feature human rights and justice concerns that should be at the heart of U.S. policy toward Kenya. Monica Juma, Kenya's cabinet secretary for foreign affairs, says trade and capacity-building in security, including bolstering Kenya's counter-terrorism efforts, are on the agenda. Since his election in 2013, President Kenyatta and his administration have been clawing back on the country's human rights gains under the guise of national security and combating terrorism. Kenya made world news headlines in 2007 and 2008 when elections unleashed horrific ethnic violence, leaving about 1,100 people dead. Since then, police officers have been implicated in killings but not held to account. Last year's elections again turned violent as police used lethal force against protesters, killing opposition supporters; armed gangs killed others. Impunity for the police and security force abuses is a major problem in Kenya, as is the government's increasing repression of nongovernmental groups and journalists and mistreatment of refugees. 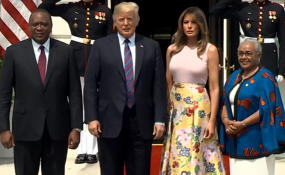 Given President Trump's record of embracing foreign leaders with abusive human rights records, it's unlikely he will raise with Kenyatta the need for accountability, more respect for basic rights, or call for a halt to the well-documented killings by police. Indeed, President Trump's own policies and practices -- to prosecute migrants and separate families at the U.S. southern border, disparage peaceful protests, and claim journalists are "the enemy of the people" -- undermine the president's credibility on rights issues. Although the previous administration didn't always go the distance, there was consistent diplomatic engagement on human rights issues. But during last year's contested elections, despite a strong U.S. ambassador on the ground and U.S. support in the technical aspects of the election, the absence of White House leadership was noticeable. U.S. policymakers should be concerned about these practices, particularly those of Kenya's security forces; the United States is one of the biggest donors to Kenya's security forces. Yes, Kenya needs to make fundamental changes in how it manages the ongoing threat of terrorist attacks, but the abuses by its own police and counterterrorism forces make the situation worse. They discriminate against and intimidate Kenya's Somali and Muslim community with aggressive tactics. A 2016 Human Rights Watch report found that police and military units that receive support from the United States were implicated in extrajudicial killings in northeastern Kenya and disappearances of those suspected of links to Al Shabab, the militant Somali Islamic group. Equally important to Kenya -- and the stability of the region -- is the effect that weak protection of civil rights has on a healthy trade and business environment. Kenya's nongovernmental groups and the media should be able to carry out their work freely, with the ability to raise issues of critical concern such as governance issues, corruption and other abuses. More rule of law, not less, would be better for U.S. interests. The Trump administration appears to have relegated human rights to the periphery, and Kenyatta likely feels he won't have much explaining to do in Washington about his government's abusive policies. Congress should step in, demand accountability from Kenyatta, and make clear that human rights remain an integral part of U.S. foreign policy.